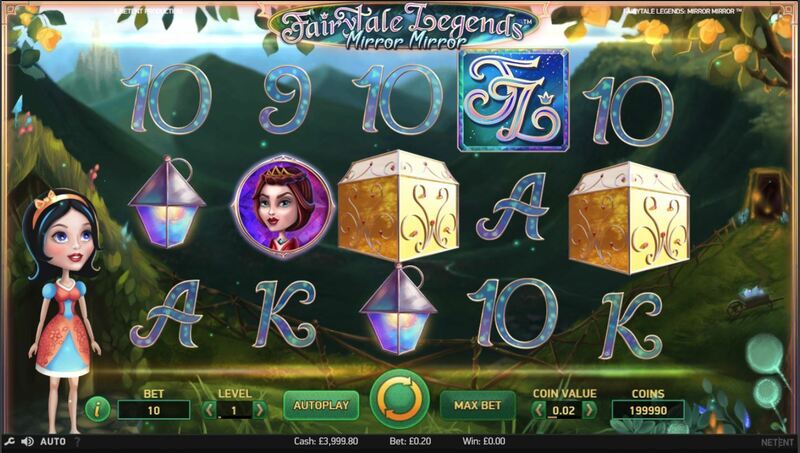 Fairytale Legends: Mirror Mirror is Net Entertainment’s third installment in the Fairytale Legend series. 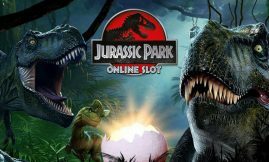 It is a 243 way-to-win, 5 reel low variance 3D slots that’s fun and maintains all the easy-to-understand gameplay with loads of bonus innovations (7) of which 3 are randomly triggered during the main game. 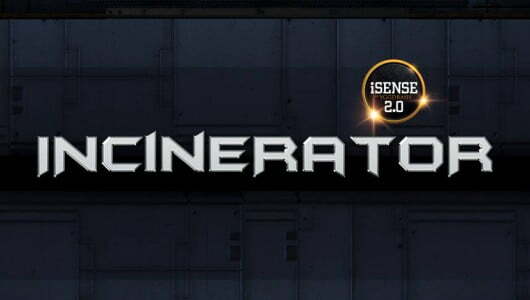 The momentum of the game is further propelled by a free spins feature that gives you 10 free spins, on top of this it has a Mirror Re-Spin feature that can be randomly triggered on each free spin. The top cash prize is a jackpot of 150 (1,822.5x your stake) coins. From the very first spin the game captures the upbeat yet enduring spirit of Snow White and the seven dwarfs that engages patrons with pin-dropping audio and a host of captivating bonus features. Symbols on the reels are the mirror, lanterns, princesses, queens, the Fairytale Legends logo, cards from 9 to Ace and gemstones. 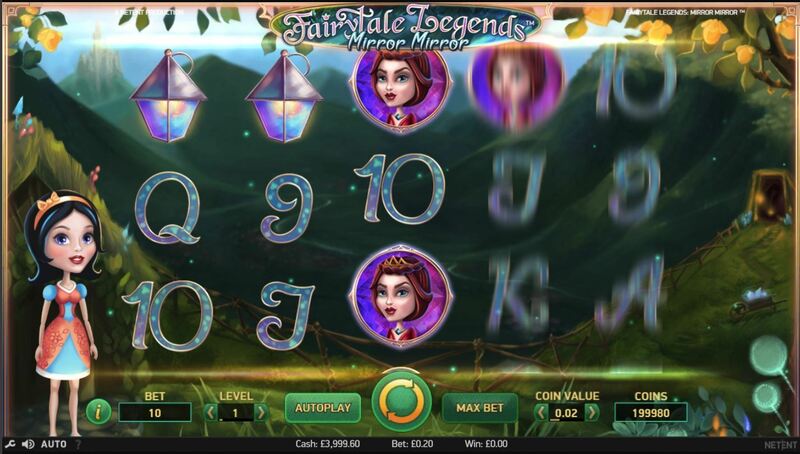 The most valuable symbol is the Fairytale Legends logo, 5 of them on your screen at the maximum bet pays 15x your stake. The RTP or average return to player percentage of Fairytale Legends: Mirror Mirror is 96.48%. 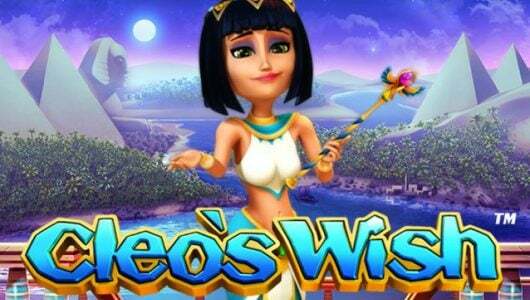 play this slot at our best NetEnt Casinos. The slots is played on 243 bet ways with 1 to 10 levels, up to 10 coins can be wagered per level. The Auto Play feature spins the reels automatically for a selected number of rounds and the game is playable on mobile phones (Androids, iOS, tablets) or PC desktops (Apple Mac, Windows) from £0.10 up to £100 per spin. During the base game the mirror symbol pops up on the reels, it’s responsible for triggering the Mirro Re-Spin bonus game that transforms into a queen or princess symbol. The chosen symbol remains locked upon the reels for the duration of the re-spin. At an average bet per spin of £1 our biggest win during the feature was £22 (22x our stake). One spin is given the moment a cluster of 5-7 win symbols pitch. The feature sees a medium value symbol selected in conjunction with lower value symbols that’s transformed into the symbol that’s been chosen until a winning combination is formed. In the centre of the reel set the Mirror symbol triggers the Mirror Re-Spin feature. A new screen opens up displaying 9 crystals, in order to collect a cash prize your job here is to break them one at a time with a pick axe. The top cash prize you can win here is 15x your stake. Of the bonus rounds the free spins feature is the most lucrative, 10 free spins are awarded. But, there’s another treat in the form of the Mirror Re-Spin feature during the free spins. It’s played when one or more Mirror symbols pitch up on the reels. 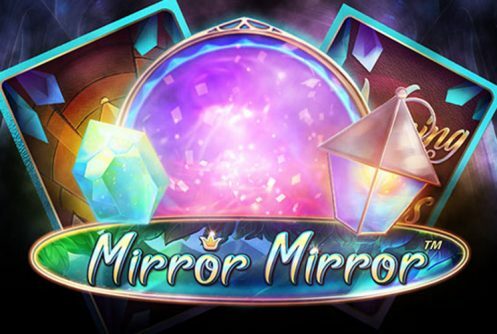 Based on our analysis of Fairytale Legends: Mirror Mirror, players can expect one of the many Bonus events to trigger on every twentieth spin (we might be wrong). 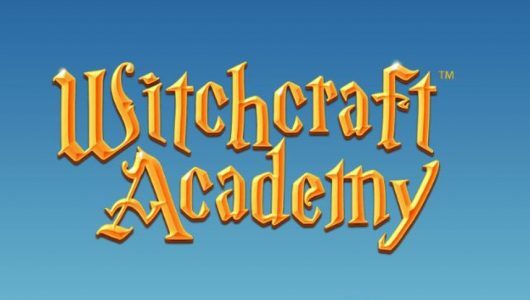 We find the game to be a low volatility experience with a lot of entertainment. The biggest amount you can win on a single free spin/re-spin is 1,822.5x your stake. It won’t make you rich but it has plenty of bonus rounds that will keep the bankroll ticking over. The other two slots in the series are Fairtytale Legends: Hansel & Gretel and Fairytale Legends: Red.